This is private property. The people in the first house own the second house. They allow visitors to the cemetery but would prefer to be notified first. The eastern half of the cemetery is surrounded by a bois d'arc fence. The western half is surrounded by a 4-foot chain link fence. The fences are not visible from CR 815, but can be seen from the back on the house. The Robert Rike family moved to the area around 1850. They owned 200 acres of land, reaching from the west side of Pilot Grove Creek to within a mile of old Farmersville. They had a bridge over the creek in the early 1850's. Their name was originally spelled "Reich." This cemetery is on the eastern bank of Pilot Grove Creek. The Rikes were buried on the eastern side of the cemetery with other families on the western side. There are several large trees in the former-Rike half. There are a few trees inside the fence on the western half. At one time this cemetery covered about 1 acre of land. 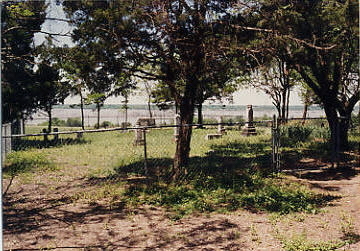 When the Farmersville IOOF Cemetery opened, all of the Rikes were moved there, except for one Rike baby, who was buried in the western side. The graves on the western side stayed in the cemetery. Most of the people still buried here belong to the Strickland family. I have heard the cemetery referred to as the Morrow/Odil Cemetery. Members of both of those families are buried here also. The former-Rike half of the cemetery is now being made into a park. The family who owns the land would like to erect an entrance and maybe do some landscaping. As far as I know there is no deed for the cemetery. The house in front of the cemetery was once a Nazarine church building that was moved from Farmersville. The Farmersville Historical Society has published a cookbook that includes a photo and a brief history of the church. The owners have made a vacation home out of the building. It still has the original attendance board and pulpit. This cemetery is well cared for. In 1992 the Sheriff's Department cleaned this cemetery and repaired the bois d'arc picket fence around it. They returned in 1993 to burn the brush left behind the previous year.